This quid is dried out, but came out of the mouth of an old horse with bad dental problems. 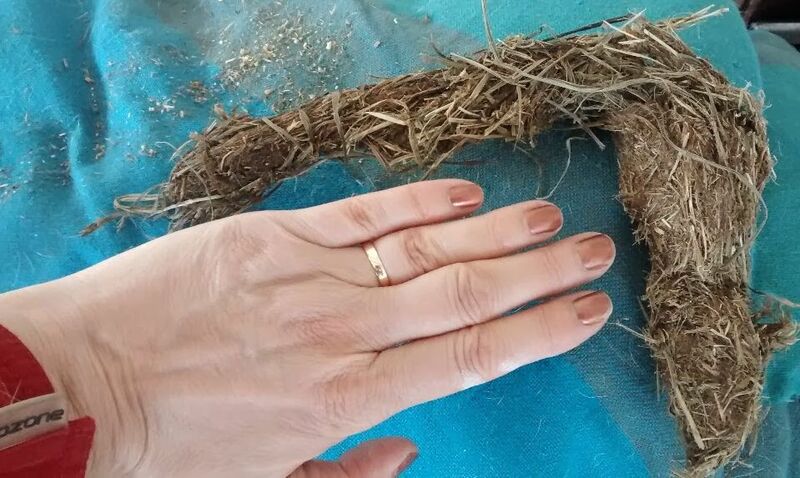 Are you finding strange lumps of hay that look a bit like bird's nests gone awry in your horse's stall or paddock? These lumps are called quids and will mean it's time to call your veterinarian or equine dentist. A horse that quids isn't swallowing its food properly and that can cause it to lose condition as it doesn't get the nutrition it needs. Another word for this is cudding, as the wad of hay or grass looks like the cuds that cows regurgitate to chew after grazing. Just looking at your horse, it may not be apparent that there is a problem in its mouth. A sharp eye may be able to spot muscle imbalances and irregularities in the way the horse chews. However, most of us will first notice a horse is quidding when we find the partially chewed boluses of hay strewn around the feeder, or see the horse spilling large quantities of grain out of its mouth when it eats. Those soggy lumps of mashed hay are a sure sign that there is something going on in your horse's mouth that needs the attention of a veterinarian or equine dentist. You might also notice your horse has very bad breath if the quidding is caused by an infection somewhere in the horse's mouth. Horses that quid are also at risk of choke, so it's important to look after this problem as soon as you notice it. There are different causes why horses are unable to chew properly and start to quid. The most common reason is that the horse has dental problems. Overgrown or fractured teeth, infected gums, teeth with sharp edges or missing teeth can impair the way the horse chews. Overgrown, broken, or sharp teeth may cause the horse to lacerate the inside of their cheek or tongue when they chew. As a result, they may not completely chew some food because of the pain. Another cause of quidding is that the horse may have a foreign object wedged somewhere in its mouth, and this too can cause the horse to only partially chew its food. A horse that has a jaw injury may not be able to chew properly. And, paralysis, such as what can be caused by a viral disease like EEE may also prevent a horse from being able to chew properly. Finding wet lumps of partially chewed hay or grass is a sure sign that there's something going on in your horse's mouth that needs attention. A horse that quids may also drool out a lot of its grain because it's unable to grind the grain with its teeth. A veterinarian or equine dentist can float any long or sharp teeth, extract broken or infected ones, or treat an infection in your horse's mouth. This may be all it takes to stop the quidding. If the horse has severe or longstanding dental problems, it may take more than one floating to get its mouth back into shape. Because the horse has been compensating for the pain in its mouth, it could take a while before it redevelops its facial muscles and feels comfortable enough to chew its food more thoroughly. Some horses may continue to quid out of habit. If dental work isn't needed or doesn't stop the quidding, a veterinarian can help you determine if a jaw injury like a dislocation or fracture is causing the problem. Chances are if your horse has a neurological disease that prevents it from eating properly, you'll already be treating it for that, and once the horse has recovered, the quidding should go away too. For older horses that have very worn or missing teeth, there may be no actual treatment beyond making sure the horse is fed fodder and concentrates that are very easy for it to chew and swallow. This might include soaking the feed or feeding mashes that aren't hard to chew. While you are waiting for the vet or dentist to treat your horse, be sure to provide it with easy to chew feed. This may include water-soaked chopped hay or hay cubes and beet pulp. Concentrates should be easy to chew—no large pelleted feed, and your horse may be able to consume it more easily if it's wetted. If a broken tooth or infection is causing the problem, offering slightly warmed water may help your horse drink more comfortably. Regular dental care is important throughout your horse's life. Most horses need to have their teeth floated at least once a year. As your horse ages, you will have to modify its feed, perhaps offering fodder and concentrates that are easier to chew, swallow and digest. Horse with a really severe tooth lose or worn teeth will benefit from having their feed wetted. To avoid viral and neurological problems, regular vaccinations are essential.